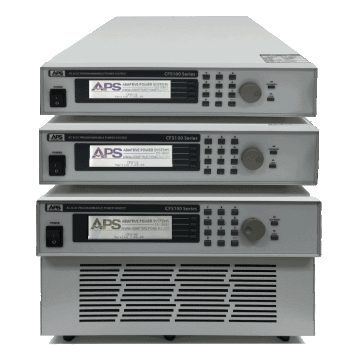 The CFS100 Series programmable AC or DC output power sources are cost effective source of power for development, test and production applications requiring anywhere from 800VA or less to 4000VA of single phase AC or DC output. This series consists of three models, CFS108, CFS116 and CFS140. All models share a modern PWM switch mode design for optimal performance and efficiency. These units are excellent source for 50, 60 or 400 Hertz for export product testing as well as testing DC powered equipment. For questions regarding the CFS100 Series, please contact us. 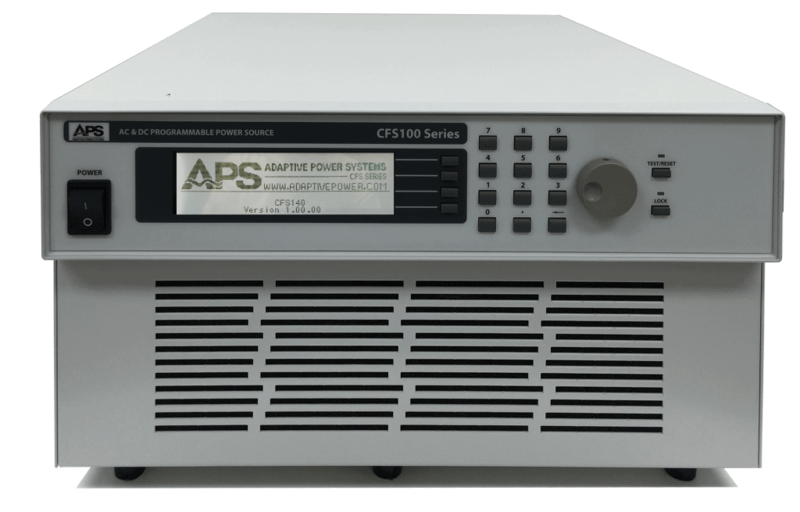 The CSF100 Series programmable AC and DC output power sources are easy to use instruments which provide precisely controlled frequency and voltage conversion. The frequency can be adjusted from 40 to 500 Hertz for applications such as the testing of military/avionics equipment or for the operation of 400 Hertz electronics that are onboard an aircraft or a military vessel. The adjustable frequency band in conjunction with the dual voltage ranges of 0-150 volt or 0-300 volt as well as DC test capability provides full capabilities for testing and operating electronics deployed worldwide. Setup and operation of the CFS100 Series is easy. The large LCD display and simple front panel controls allows users to vary voltage and frequency using the shuttle or by entering a value directly using the decimal keypad. The LCD displays readouts for frequency, voltage, current, peak current, crest factor, power, apparent power and power factor. 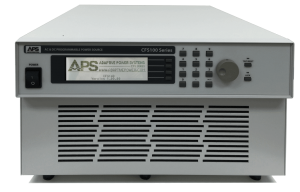 The CFS100 Series power sources are a reliable and cost effective solutions for all of your single phase AC power and DC power needs! The CFS100 Series Power Sources are equipped with a powerful microcontroller to create a stable and accurate output, regardless of AC input line conditions. It can be programmed to supply a variety of AC or DC power conditions to the device under test and meters all output parameters. The CFS100 Series is an excellent source of stable AC voltage over a frequency range of 40 to 500 Hz. The output frequency is quartz-crystal stabilized. Output voltages up to 300 VAC are provided. 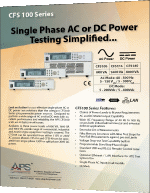 With the ability to provide any single phase voltage and frequency combination found around the world, the CFS100 Series is a great choice for evaluating AC power input supplies for worldwide use. The CFS100 Series includes a DC output mode that allows for development or testing of DC powered products up to 400 Vdc. Current and power limit are available in DC mode as well. Whenever 400Hz, 115Vac single phase is required to power up shipboard or airborne equipment, the CFS100 can do the job. 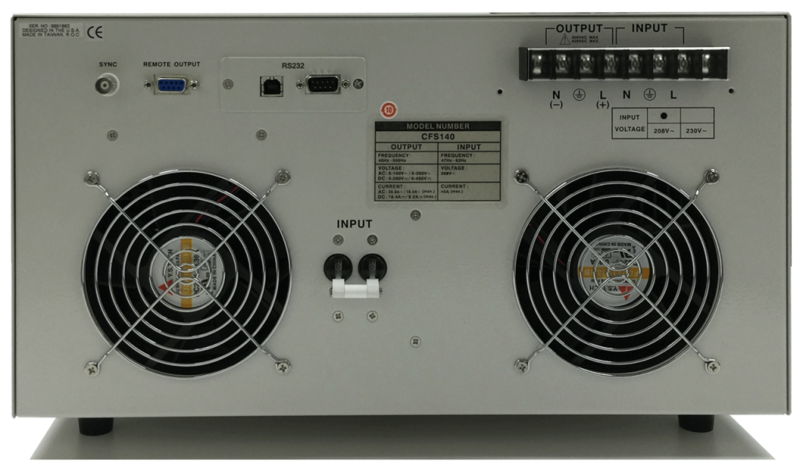 With up to 38.6 A of current available (Model CFS140), most single phase input equipment can be powered up for repair or test purposes.